Size: True scorpions range in size from about 1 inch to well over 7 inches in length. Color: True scorpions range in color from light yellowish tan to very dark brown. They are easily identified by their large front claws and their long, narrow tail, tipped by a pointed stinger. One of the most dangerous varieties is slender and yellow with two dark stripes on its back. Habits: True scorpions are arachnids, and have four pairs of legs in addition to a pair of modified claws. Although they can inflict a very painful sting, the venom of most species is considered of little health consequence to humans except for the very young and the elderly. Scorpions can live five years or more. True scorpions prefer the outdoors but will wander inside through cracks in a building. Once inside, they often make their way into shoes, piles of clothing and beds which, increases the chance of a human being stung. Diet: All true scorpions are predators that feed mainly on other insects; using their stinger to subdue the prey. Reproduction: Female scorpions do not lay eggs, but instead give birth to live young which climb onto the females back and remain there until their first molt, around one or two weeks later. Up to 100 young are possible from a single female. After mating the male scorpion is often eaten by the female. 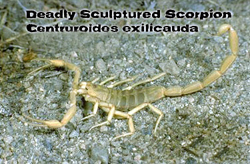 Other Information: True scorpions hide during the day and become active at night, which helps them manage temperature and water balance, important functions for survival in dry habitats. Many species dig burrows in the soil and they have a well-developed sense of hearing. Scorpions hide under stones, bark, wood or other objects on the ground where they wait or search for prey.